2 Strips of smoked streaky bacon. This recipe is easy and you can change the sauce, if you do not like tarragon it could be a mushroom sauce or just a wine sauce, you can make the sauce before and it can be heated later and finished off so it is quite a versatile dish. I would not recommend freezing this dish it is far better made fresh. 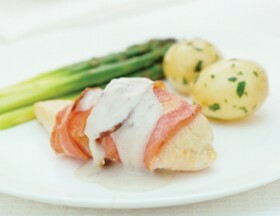 Wrap the bacon around the chicken breasts and bake for 20-30 minutes in the oven 180 degrees till the bacon looks crisp and golden. At this point you should add the cooked chicken breasts, they should sit in the sauce and simmer away taking on the tarragon flavour. Add the cream to the sauce and if you need it to thicken turn up the heat a little and it will thicken more, but be careful as it can quickly end up with no sauce. ServeS 2, serve with baby potatoes and green veg. You cannot pre-cook the chicken then reheat it as that could be dangerous.